This is “Global Stratification”, section 6.5 from the book Sociology: Brief Edition (v. 1.1). For details on it (including licensing), click here. Describe the most important characteristics of wealthy nations, middle-income nations, and poor nations. Describe the arguments of modernization and dependency theories. List the major effects of global stratification. For the sake of clarity and simplicity, the best way to understand global stratification is to think of the world composed of three categories of nations, based on their degree of wealth or poverty, their level of industrialization and economic development, and related factors. Over the decades, scholars and international organizations such as the United Nations and World Bank have used various classification systems containing three categories. One of the first typologies came into use after World War II and classified nations as falling into the First World, Second World, and Third World. The First World was generally the western, capitalist democracies of North America and Europe and certain other nations (Australia, New Zealand, Japan). The Second World was the nations belonging to the Soviet Union, while the Third World was all the remaining nations, almost all of them from Central and South America, Africa, and Asia. Although this classification was useful for several reasons, the demise of the Soviet Union by the end of 1991 caused it to fall out of favor. A replacement typology placed nations into developed, developing, and undeveloped categories, respectively. Although this typology was initially popular, critics said that calling nations “developed” made them sound superior, while calling nations “undeveloped” made them sound inferior. Although this classification scheme is still used, it, too, has begun to fall out of favor. Today a popular typology simply ranks nations into groups called wealthy (or high-income) nations, middle-income nations, and poor (or low-income) nations. This classification has the advantage of being based on the most important economic difference among the nations of the world: how much income and wealth they have. At the risk of being somewhat simplistic, the other important differences among the world’s nations all stem from their degree of wealth or poverty. Figure 6.23 "Global Stratification Map" depicts these three categories of nations (with the middle category divided into upper middle and lower middle). The world is indeed stratified to a very great degree. Source: Adapted from UNEP/GRID-Arendal Maps and Graphics Library. (2009). 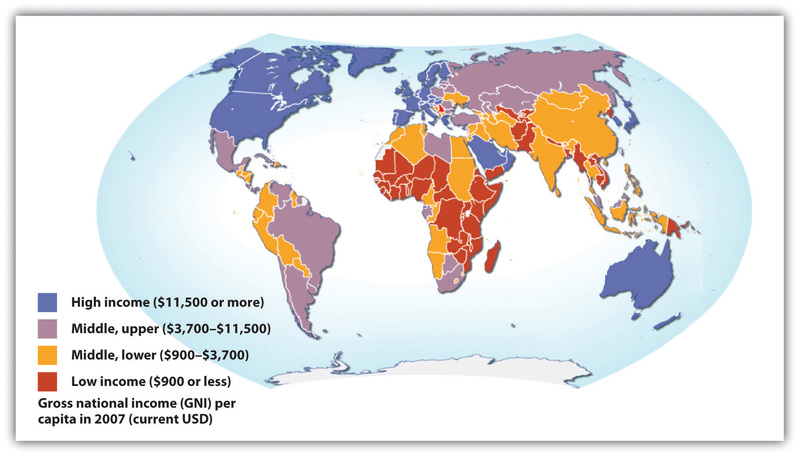 Country income groups (World Bank classification). Retrieved from http://maps.grida.no/go/graphic/country-income-groups-world-bank-classification. The wealthy nations are the most industrialized nations, and they consist primarily of the nations of North America and Western Europe; Australia, Japan, and New Zealand; and certain other nations in the Middle East and Asia. Many of them were the first nations to become industrialized starting in the 19th century, when the Industrial Revolution began, and their early industrialization certainly contributed to the great wealth they enjoy today. Yet it is also true that many Western European nations were also wealthy before the Industrial Revolution, thanks in part to the fact that they had been colonial powers and acquired wealth from the resources of the lands that they colonized. Although wealthy nations constitute only about one-fifth of the world’s population, they hold about four-fifths of the world’s entire wealth. They are the leading nations in industry, high finance, and information technology. Although each of the world’s wealthy nations is internally stratified to a greater or lesser degree, these nations as a group live a much more comfortable existence than middle-income nations and, especially, poor nations. People in wealthy nations are more educated and healthier, and they enjoy longer lives. At the same time, wealthy nations use up more than their fair share of the world’s natural resources, and their high level of industrialization causes them to pollute and otherwise contribute to climate change to a far greater degree than is true of nations in the other two categories. Middle-income nations are generally less industrialized than wealthy nations but more industrialized than poor nations. They consist primarily of nations in Central and South America, Eastern Europe, and parts of Africa and Asia and constitute about one-third of the world’s population. There is much variation in income and wealth within the middle-income category, even within the same continent. In South America, for example, the gross national income per capita in Chile, adjusted to U.S. dollars, is $13,270 (2008 figures), compared to only $4,140 in Bolivia (Population Reference Bureau, 2010).Population Reference Bureau. (2010). 2010 world population data sheet. Washington, DC: Author. Thus many international organizations and scholars find it useful to further divide middle-income nations into upper-middle-income nations and lower-middle-income nations. Not surprisingly, many more people in the latter nations live in dire economic circumstances than those in the former nations. In Bolivia, for example, 30% of the population lives on less than $2 per day, compared to only 5% in Chile. Poor nations are certainly the least industrialized and most agricultural of all the world’s countries. This category consists primarily of nations in Africa and parts of Asia and constitutes roughly half of the world’s population. By any standard, people in these nations live a desperate existence in the most miserable conditions possible. They suffer from AIDS and other deadly diseases, live on the edge of starvation, and lack indoor plumbing, electricity, and other modern conveniences that most Americans take for granted. Most of us have seen unforgettable photos or video of African children with stick-thin limbs and distended stomachs symptomatic of severe malnutrition. We revisit their plight in a later section on the consequences of global stratification. Explanations of global stratification parallel those of U.S. inequality in their focus on individual versus structural problems. One type of explanation takes an individual, blaming-the-victim approach by in effect blaming the people in the poorest nations for their own poverty, while a second explanation takes a more structural approach in blaming the situation of the poorest nations on their treatment by the richest ones. Again there is evidence to support both types of explanations, but many sociologists favor the more structural explanation. The individual explanation is called modernization theoryThe view that global stratification results from a failure of poor nations to have the beliefs, values, and practices necessary for industrialization and rapid economic growth. (Rostow, 1990).Rostow, W. W. (1990). The stages of economic growth: A non-Communist Manifesto (3rd ed.). New York, NY: Cambridge University Press. According to this theory, rich nations became wealthy because early on they were able to develop the “correct” beliefs, values, and practices—in short, the correct culture—for trade, industrialization, and rapid economic growth to occur. These cultural traits include a willingness to work hard, to abandon tradition in favor of new ways of thinking and doing things, and to adopt a future orientation rather than one aimed toward the present. Modernization theory has direct relevance for the experience of Western Europe. According to the theory, Western European nations began to emerge several centuries ago as economic powers because their populations adopted the kinds of values and practices just listed. According to Max Weber (1904/1958),Weber, M. (1958). The Protestant ethic and the spirit of capitalism (T. Parsons, Trans.). New York, NY: Scribner. (Original work published 1904) one of the founders of sociology, Western Europe was able to do this because the Protestant Reformation diminished the traditional distrust of the Catholic Church for material success and social and economic change. The new Protestant ethic that Western Europeans adopted stressed the importance of hard work and material success in one’s lifetime, rather than the traditional emphasis on rewards in an afterlife. According to modernization theory, poor nations are poor because their people never developed values such as an emphasis on hard work. According to modernization theory, nations in other parts of the world never became wealthy and remain poor today because they never developed the values and practices just listed. Instead, they continued to follow traditional beliefs and practices that stymied industrial development and modernization. As should be clear, modernization theory has much in common with the culture of poverty theory discussed earlier. It attributes the poverty of poor nations to their failure to develop the “proper” beliefs, values, and practices necessary for economic success both at the beginning of industrialization during the 19th century and in the two centuries that have since transpired. Because modernization theory implies that people in poor nations do not have the talent and ability to improve their lot, it falls into the functionalist explanation of stratification. The structural explanation for global stratification is called dependency theoryThe view that global stratification results from colonialization and exploitation of the poorest nations by the richest ones.. Not surprisingly, this theory’s views sharply challenge modernization theory’s assumptions (Packenham, 1992).Packenham, R. A. (1992). The dependency movement: Scholarship and politics in development studies. Cambridge, MA: Harvard University Press. Whereas modernization theory attributes global stratification to the “wrong” cultural values and practices in the poorest nations, dependency theory blames global stratification on the exploitation of these nations by the rich ones. According to this view, the poor nations never got the chance to pursue economic growth because early on they were conquered and colonized by European ones. The European nations stole the poor nation’s resources and either enslaved their populations or used them as cheap labor. Because dependency theory implies that poor nations remain poor because of lack of opportunity owing to exploitation by wealthy nations, it falls into the conflict perspective on stratification. In today’s world, huge multinational corporations continue to exploit the labor and resources of the poorest nations, say dependency theorists. Often these corporations work hand-in-hand with corrupt officials in the poor nations to strengthen their economic stake in the countries. An example of this dynamic occurred during the 1990s in the poor western African country of Nigeria, where the Royal Dutch/Shell oil company at the time was pumping half of that nation’s oil. Activists in southern Nigeria began to claim that Shell’s oil drilling was destroying their land and that Shell was paying them too little for their oil. In response to their protests, the government sent in police at Shell’s request, with Shell paying some of the police costs. The police put down the activists’ dissent by destroying several villages and killing 2,000 people (P. Lewis, 1996).Lewis, P. (1996, February 13). Nigeria’s deadly war: Shell defends its record, The New York Times, p. 1. Which makes more sense, modernization theory or dependency theory? As with many theories, both make sense to some degree, but both have their faults. Modernization theory places too much blame on poor nations for their own poverty and ignores the long history of exploitation of poor nations by rich nations and multinational corporations alike. For its part, dependency theory cannot explain why some of the poorest countries are poor even though they were never European colonies; neither can it explain why some former colonies such as Hong Kong have been able to attain enough economic growth to leave the rank of the poorest nations. Together, both theories help us understand the reasons for global stratification, but most sociologists would probably favor dependency theory because of its emphasis on structural factors in the world’s historic and current economy. Global stratification greatly affects the life chances of people around the world. As noted earlier, people in the poorest nations live in some of the worst conditions possible. AIDS, malaria, starvation, and other deadly diseases are common. Many children die before reaching adolescence, and many adults die before reaching what in the richest nations would be considered their middle age. Many people in the poorest nations are illiterate, and a college education remains as foreign to them as their way of life would be to us. One of the most important indicators of a nation’s well-being is infant mortality (the number of infant deaths during the first year of life for every 1,000 births), and the global picture of infant mortality presents sad, striking evidence of the difference that a nation’s poverty makes. Because of poor prenatal and postnatal nutrition, disease, and the other dire conditions facing people in the poorest nations, their rates of infant mortality are shockingly high and manifest one tragic effect of global poverty. Later chapters further discuss the difference that global stratification makes for health and illness, infant mortality, life expectancy, and other life chances. For now, it is instructive to compare one wealthy nation, the United States, with one poor nation from Africa, Uganda, on some important socioeconomic and other indicators as presented in Table 6.2 "The United States and Uganda". As will be obvious, Americans and Ugandans live very different lives, notwithstanding the high degree of poverty found in the United States compared to other wealthy nations. The typical American lives a comfortable life that the typical Ugandan can only dream of, while the typical Ugandan lives a life that the typical American would find only in her or his worst nightmare. Source: Population Reference Bureau. (2010). 2010 world population data sheet. Washington, DC: Author. According to modernization theory, rich nations became rich because their peoples possessed certain values, beliefs, and practices conducive to the acquisition of wealth. Poor nations remained poor because their peoples did not possess these values, beliefs, and practices and never developed them. According to dependency theory, poor nations have remained poor because they have been exploited by rich nations. People in the poorest nations live in some of the worst conditions possible. Deadly diseases are common, and many children die before reaching adolescence. Which theory makes more sense to you, modernization theory or dependency theory? Explain your answer. Do you think rich nations are doing enough to help poor nations? Why or why not? It is easy to understand why the families in Wichita, Kansas, discussed in the news story that began this chapter might be poor in the middle of a deep economic recession. Yet a sociological understanding of poverty emphasizes its structural basis in bad times and good times alike. Poverty is rooted in social and economic problems of the larger society rather than in the lack of willpower, laziness, or other moral failings of poor individuals themselves. Individuals born into poverty suffer from a lack of opportunity from their first months up through adulthood, and poverty becomes a self-perpetuating, vicious cycle. To the extent a culture of poverty might exist, it is best seen as a logical and perhaps even inevitable outcome of, and adaptation to, the problem of being poor and not the primary force driving poverty itself. Adopt a national “full employment” policy for the poor, involving federally funded job training and public works programs. Improve the schools that poor children attend and the schooling they receive and expand early childhood education programs for poor children.